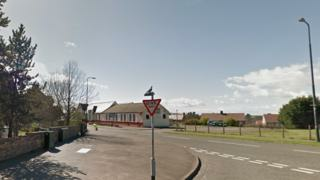 An 80-year-old woman has died after being hit by a car as she crossed a road in Midlothian. The accident happened at the junction of Mayfield Road and Easthouses Road in Dalkeith at about 13:40 on Friday. The dead woman has been named by police as Margaret McKenzie, who lived in Dalkeith. The driver of a light-coloured Suzuki Jimny involved in the crash stopped at the scene before emergency services arrived. Police officers are urging anyone who witnessed what happened to come forward. Sgt Dominic Doyle, from Dalkeith's road policing unit, said: "A number of members of the public stopped to help emergency services at the scene and we are grateful to them for their assistance. "Anyone who may have been recording by dash-cam and who could have footage of the incident is asked to provide this to officers as soon as possible."